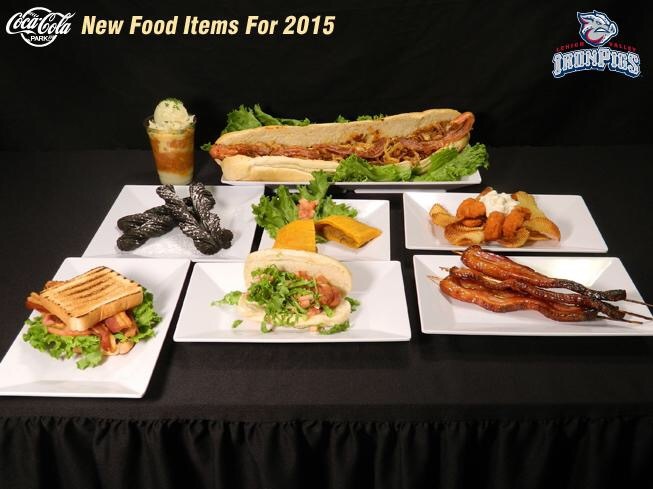 There will be a plethora of new food choices over at Coca Cola Park this season. Some, in concert with the new Pig Pen seating area, and some available elsewhere. No doubt, they will all have bacon in, on, or infused into them. And, no doubt they’ll be good, if Chef Jerry is involved. But that’s not why we’re here today. We’ll have more on the menu additions in the photo above, once we learn where they are available, how much they cost, and have a chance to, umm, “test” them. We’re here today because I’d like to ask for a moment of silence for my dearly departed Pig Stop. It was a good run, but the Pig Stop will be no more in 2015–at least not in it’s original form. Let me take you back. In 2008 and 2009 the Pig Stop was a super-premium food concession located in the Club Level lounge area. The menu choice would vary nightly, and included such premium offerings as Steamship Ham and Prime Rib. The prices were fair and the food was good. It was a great way to have an actual meal at the game and avoid the standard ballpark offerings. It was a nice perk for the Club Level, and was part of the reason I originally purchased my season tickets upstairs–access to the Pig Stop. In 2010, some picayune health department “violations” caused the Pig Stop to go dormant for a time. Soon, it emerged like a Phoenix as a premium sandwich station: Grilled offerings, paninis, cubans, riffs on pulled pork and hot dogs, specialty sausage sandwiches, chicken wings at one point…the list goes on. Over the past couple seasons Chef Jerry and Chef Jan did a great job keeping it fresh and giving us something different to look forward to. As the menu choices were announced in the season ticket holder emails, I would publish them here for my fellow Club Level denizens. It was all good. Except, some nights the sales were poor. Food was going to waste, and although “profit” wasn’t a named motive, certainly quality couldn’t remain high with such limited sales. So what’s next? The Pig Stop should still be available if you need a quick bottle of soda or a piece of pizza or an inferior soft pretzel. In addition, you will be able to place a food order from the Club Level Bar Menu and maybe even have it delivered to your table in the club lounge. In the past, the bar menu was only availble at the bar, where you had to sit and wait. Plus, the bartenders can get VERY busy on some evenings making it tough to place orders and even tougher for the food to get delivered. This should relieve some of the crunch over there. There may be some changes to the bar menu for this season, as well, but the details are not available yet. Specials may be available, too, but that is yet to be determined. I know there’s a groundswell of request for some kind of Chef’s Salad or the like. So stay tuned, and we’ll keep you posted. Don’t worry about me–I won’t starve without the Pig Stop. Sometimes–and hopefully this is one–change is good.